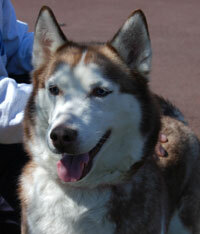 Daisha is a beautiful red and white female Siberian Husky with baby blue eyes. She is approximately three years old and somehow lost her family. When we welcomed her into MaPaw she greeted us with tail wags and fantastic kisses. Daisha is a very affectionate girl who has a lot of love to give. We are getting to know her and loving her more each day! Please check back or feel free to contact us about this sweetheart.